Daniel Berg stopped by the studio to work on some new material this week! I sat down with the “Fireberg” producer who, originally from Philadelphia, moved to Brooklyn in 2009. About a year later he started working under the pseudonym “Fireberg” in which he produces electronic music and loops for live performances. 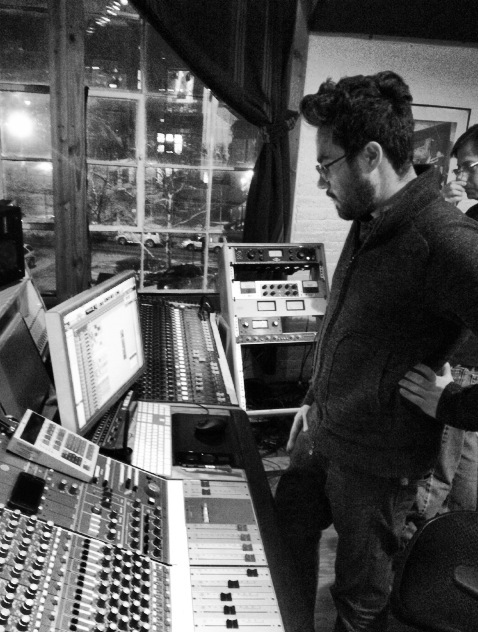 Dan is putting the finishing touches on a compilation EP made up of plethora of songs recorded over the past three years. If you had to give the album a concept, Dan says,” The concept would be without a voice”, and for the simple fact that the album has no recorded vocals. Where Dan lacks in vocals, he makes up for in varying samples of old school informational videos telling you things you should already know like not to do drugs or stay in school. Throw a couple vinyl samples, hip-hop influences, and an understanding of the different components of jazz into the mix and you have the self-proclaimed “Eclectronic” style of music Dan loves to make. When making a musical album the process and where the actual sounds are coming from are key. Dan uses both the MPC 2000XL, which is similar to the MPC2000 but with many newer features, and the ENSONIQ ASR- 10, a 16-bit sampler to create his unique sound. Dan explains, “They both are amazing and can make colors using almost any snippet of sound…” Jazz is also a major part of Dan’s sound having studied Jazz all throughout high school; he goes on to explain some fundamentals of Jazz, “I choose to use the warmest parts of Jazz instead of the showy, almost aggressive sounds, essentially taking the melodies and cords and straying away from the baselines.” With all of these elements making up your sound, it makes it hard to be put into a box which other artists have a hard time getting out of. What Dan says to that is, “The good thing about living in New York is that there are no rules!” and that mindset, I believe, will keep him out of that box for years to come. Posted in Dan Berg, Dance, Electronic, Music Genre and tagged Dan Berg, Eclectronic, Fireberg.